There are many methods of dredging that were used all throughout the world to process gravels to remove the gold, but one that proved to be of huge importance in the early 1900s was the bucket line dredging. Bucket line dredging started in New Zealand in 1882 and was first used in the US in the Bannock District of Montana in 1893. Their use later spread all throughout the western United States, and many of the richest placer mining districts employed these huge dredging operations to recover placer gold from river channels. During the first part of the 20th century, dredging accounted for a considerable amount of gold that was mined throughout the world. Millions of ounces in gold are credited with this single piece of mining equipment. The bucket line dredge operates with chains of buckets, known as boom, which are carried by a digging ladder. It also consists of gold-separating devices, screening apparatus and anchoring arrangements.The chain is driven by upper tumbler and is usually fixed at the bottom with lower tumbler. The buckets that are filled in their rotation in the lower tumbler are then emptied on the upper tumbler, which are then transported for processing. The main part of the bucket line dredges is the hull where the deposits are transported and processed. The gravels first pass across a sieve, where the large non-gold materials are removed. 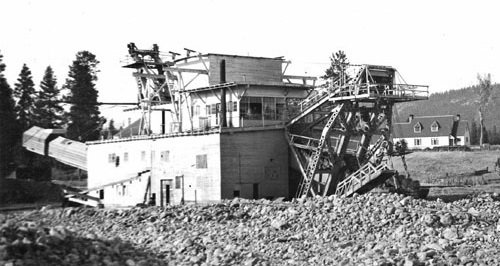 The gravels that now contain smaller materials are then passed through a sluice system (a gold recovering device) and the waste deposits, both large and small, are passed to the back of the dredge with the help of conveyor belts. These waste deposits are then dumped out of the back of the dredge. Bucket line dredging can be of two types; an open or a close connected chain. In the case of an open bucket chain, a link is placed between each bucket. Whereas, for a close bucket chain, there is no link and therefore can carry twice as much bucket compared to an open bucket chain. However, the open bucket chain is advantageous in the sense that, if a large rock or boulder is stuck between the buckets, there is less likelihood that the boulder will break any pins of the bucket or will break the chain itself. On the other hand, the close bucket chain proved to be advantageous in the case of the amount of material being processed. More materials processed meant more gold could be recovered in a short amount of time. The buckets would pull gravels up into the body of the dredge and then empty at the head of a large, revolving screen known as the trommel. These trommels are made up of perforated plates, which help in breaking the lumps of gravels into smaller materials. High-pressured nozzles are placed at the head of the screen, which are used to spray water on the materials, eventually transporting them to the sluice system. One of the functions of bucket line dredging was that it had to be manually anchored in position. They used to be locked in place with the help of a large stake known as spuds. There are two spuds. Both are long and vertical, placed at the stern of the dredge and capable of being raised and lowered. The dredge and the bucket chains, then move forward to scoop out all the materials. Once the area was depleted of materials, one of the spud is raised to make the dredge move forward. Bucket line dredging had quite an impact on the environment. They were used from the late 1800’s through the mid-1900’s. While they were incredibly efficient at processing gravel, but the waste deposits that were discharged into the rivers caused flooding issues for people living in nearby areas of the operation. Due to this, bucket line dredging has been banned in most countries today. The different bucket line dredges were all set up differently, and some were more efficient than others. They certainly missed some gold, and you can still prospect in the old dredge tailings that were left behind and find gold in them today. Large gold nuggets and specimens were also lost out of the back of most dredges. This is because the screens and trommels of most dredges were set up to reject larger material like rocks and gravel, but on the rare occurrence that a big gold nugget would enter the dredge, it would simply get rejected as well. Occassionally the workers would notice the large nugget running through the dredge and stop operations to grab it, but most were missed. Other times, they would see the nugget but by the time they got the dredge shut down it had already been rejected out of the back of the dredge and buried under the dredge pile. Metal detecting is the most effective way to find big gold. By scanning the dredge tailing piles you can dig up the metal targets that are scattered among the rocks and gravel. On rare occasions, there are big nuggets in there. The challenge of course is the amount of trash targets that you will find in old dredge tailings. They are notoriously trashy, filled with old iron rubbish. Most people who effectively hunt in dredge piles use a metal detector with some sort of discrimination so they can be selective about the targets that they dig. While bucket line dredges are no longer used today, there are still some dredges left behind that you can still visit today. Some well preserved dredges can be found in Idaho, Oregon, California, and Alaska. It may take a bit of research to find the locations of these old dredges, but visiting them can be a fun look into our past mining history when the West was being built.